Radio No Frequency is an onstage radio show, and follows on from the Palestinian radio Dona Taraddod (which means both ‘No hesitation’ and ‘No frequency’) that has been examining the current socio-economic and political situation during the last two years. The driving forces of the show are Dona Taraddod volunteers Zina Zaarour, Lama Rabah, Faris Shomali and Henna al-Hajj Hasan: students of Birzeit University who share a critical view on Palestine and on its coverage. Radio No Frequency is characterized by biting wit and unexpected perspectives. 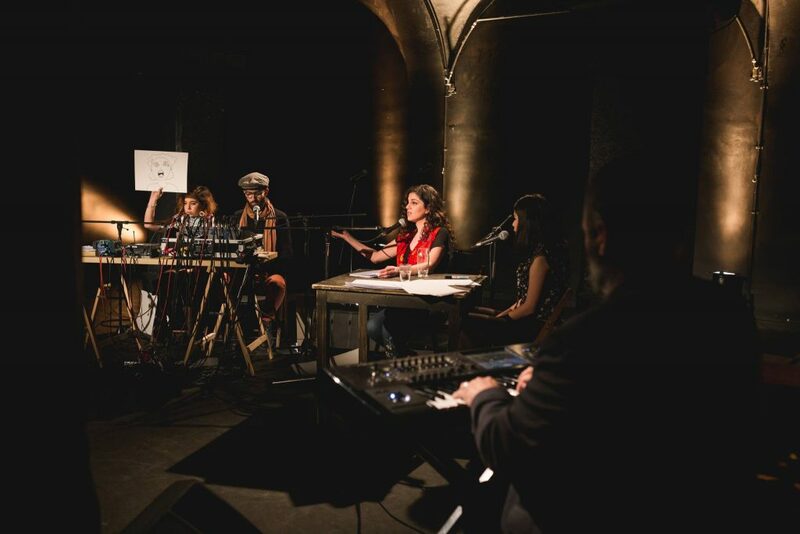 They make, together with the Belgian musicians Kaat Arnaert, Thomas Devos and Mattijs Vanderleen a live version of their monthly online radio show, creating in this way a unique Palestinian theatrical form.